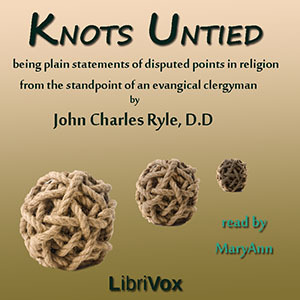 Being Plain Statements on Disputed Points in Religion, from the Standpoint of an Evangelical Churchman. The volume now in the reader's hands requires a few words of explanation. It contains nineteen papers on subjects which are matters of dispute among English Churchmen in the present day, systematically arranged. A moment's glance at the table of contents will show that there is hardly any point of theological controversy belonging to this era, which is not discussed, with more or less fulness, in these papers. The object of sending forth this volume is to meet the wants of those who may wish to see theological questions fully discussed and examined from an "Evangelical" standpoint, and complain that they cannot find a book that does this. To them I offer this volume, and respectfully invite their attention to its contents. It if does nothing else, I hope it may convince some readers that in the controversies of this day the reasonings and arguments are not all on one side.